The Phactors have vacationed on the NC coast with Rent-a-Mob relatives on several occasions, but usually later in the summer; never before in June. It turns out that this is an excellent time to visit this area for several reasons, and the two best are peaches and blueberries. The Phactor is something of a fruit snob in terms of quality, and getting the ripeness and freshness just right is seldom achieved, and never in stupormarkets. A just just under ripe peach, firm fleshed, but juicy and tender, a combination of tart and sweet peachiness is one of the best fruits in the world, and this is the considered opinion of a well-traveled, well-experienced (Hmm, maybe my fruit life list would be an interesting blog.) fruit sampler. A perfect mango comes close, very close, but these peaches just couldn't get much better. Rent-a-mob ate a peck of peaches just for breakfast. Today they can peel their own. Now blueberries are often insipid, lacking that tart counterpoint that makes their taste interesting. As a result blueberries are pretty far down my berry preference list. However these were freshly picked blueberries at just the right stage, and they were simply the best ever sampled. There were even stupormarket blueberries that served as a basis for comparison before they were discarded. Now this brings me to a very important point. Mrs. Phactor is a talented woman as surely mentioned by this correspondent many times before. 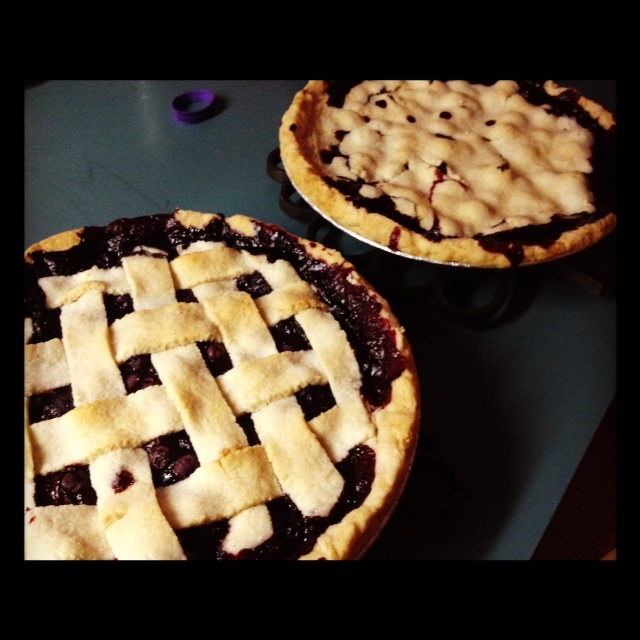 One of her greatest talents is that she makes incredible pies with perfect crusts. So this bounty of blueberries gave her an opportunity to display her talent for the crowd, and the result of transforming excellent blueberries into pie were the best blueberry pies ever. Fortunately the F1 captured the result before the pies were inhaled. Now this is part of what makes a great vacation.